At Double Island there are ten 1 bedroom Garden View Rooms with marble bathrooms and private balconies. There are also ten 1 bedroom Apartments with luxurious open plan lounge and dining areas, magnificent bathrooms, fully-equipped kitchenette, plus either a private plunge pool or outdoor spa. All Apartments and Garden View Rooms are fully air-conditioned and adjoining Apartments and Garden View Rooms may be configured to form larger two-bedroom, two-bathroom accommodation. 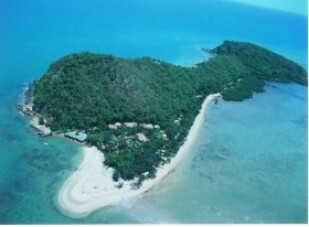 Double Island is located ten minutes off Palm Cove on the coast of Northern Queensland. The closest international airport is Cairns. Double Island is your own private luxury island getaway situated near the Great Barrier Reef inn Australia. This tropical luxury retreat can only be reserved for one group at a time, making it the ultimate luxury island getaway for weddings, conferences, off site meetings or any special occasion of your own. The accommodation on the island offers the best in tropical island luxury from the range of private apartments to the Hideaway Honeymoon suite. Double Island is a very popular destination for weddings due to its extremely beautiful and romantic setting. The facilities on the island include a games room, indoor cinema, beach side gymnasium, library, landscaped pool and outdoor spa, computer and internet access, pool and table tennis tables, and computer game stations. All of Double Island’s facilities and activities are included in the base rental fee. Apart from the huge array of recreational facilities on Double Island there are also great facilities for holding conferences and the like. For example, the Games room can be an ideal conference room and the indoor cinema is perfect for holding audio visual presentations. The Long Room restaurant has a high ceiling and open sides and is a great venue for banquets or open air presentations. There are a great variety of water-sports available such as sailing catamarans, wind surfers, canoes and kayas. There is also a unique outdoor moonlight cinema and beautifully landscaped 25m pool and outdoor spa. Palm Cove on the mainland is only 10 minutes away, so guests can also visit spas, go shopping, indulge in boat charters and scuba diving on the Great Barrier Reef, visit the World Heritage Daintree Rainforest, or partake in off road adventures.